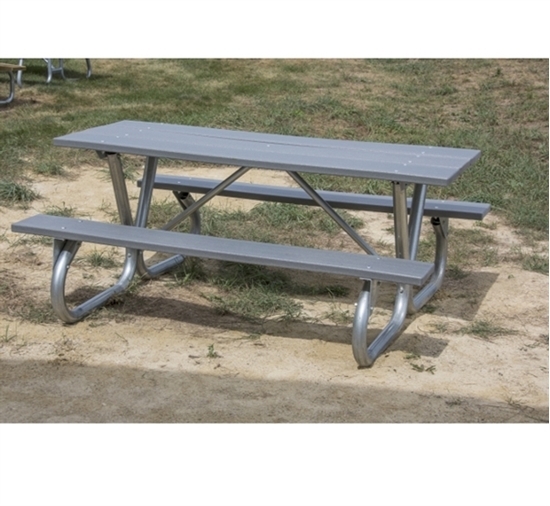 This 8 foot Rectangular Recycled Plastic Picnic Table '2BG' model is heavy duty at a reasonable price. It is made from bolted 2 3/8 inch high strength galvanized tube for greater resistance to vandalism and many years of service. Cross braces are 1 5/16 inch O.D. galvanized tube and seat brackets are 10 gauge galvanized steel. Tops and seats are recycled plastic reinforced with steel ribs. Add this popular table to your park, recreation area or campground. Portable for convenience.